Paxi is actually a group of small islands, with Paxi and Antipaxi the largest. 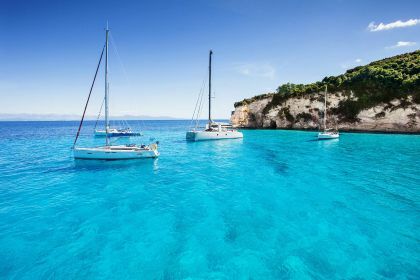 Antipaxi is renowned for its wine and beautiful sandy beaches. 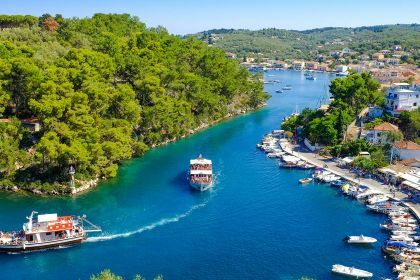 Just 13 kilometres long, the island has steep white cliffs, electric-blue sea caves, olive groves and the bustling harbour towns of Gaios and Lakka. While the island has grown as a tourist destination, Paxi has a serene and authentic atmosphere. The harbours at Gaios and Lakka, with moorings along cypress-lined inlets, are arguably the prettiest in Greece. Because Paxi is small, it’s possible to explore much of the coastline in a short period. 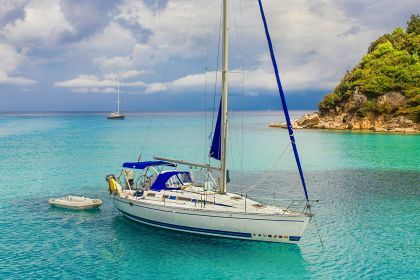 Sail into secluded coves or head to one of the many large sea caves – these are memories you’ll cherish for years to come. 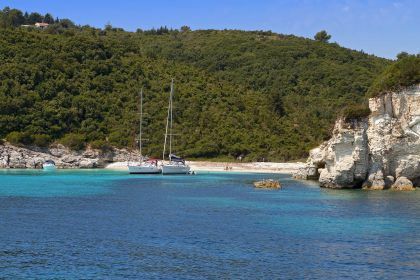 Swim and snorkel in the crystal-clear, turquoise waters of Paxi’s beaches – Voutoumi, Vrika and Monodendri, to name just a few. For a deeper marine experience, go scuba-diving in the numerous underwater caves. Get a glimpse of traditional island life and breathe in the scent of cypress and wild herbs by walking the many old mule paths that criss-cross the countryside. 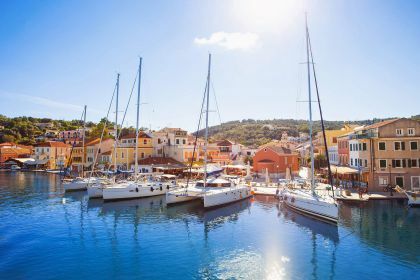 The quaint streets of Gaïos, Loggos or Lakka offer pretty souvenir shops, sidewalk cafes and laid-back tavernas. 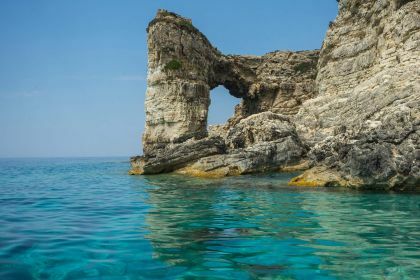 Sail out to the Tripitos Arch on the west coast and marvel at this natural rock formation, which is part of a collapsed sea cave. The water around it is turquoise and translucent, and makes for beautiful photographs and memories. Paxi has many excellent eateries, including Vassilis Taverna in Loggos, where the baked feta in filo, scorpion fish in Blanco sauce and samphire is worth tasting. Genesis Restaurant, on the seafront at Gaios, serves delectable seafood, including sea bass on champagne risotto. Nearby Mambo is also well known for its delicious seafood, including stuffed squid and seafood pasta. Roxi Bar in Loggos harbour is so close to the water you could almost step straight off your yacht onto the terrace. Its relaxed ambience and outdoor seating set against rock makes it the perfect spot for a sundowner. Nassos Tavern in Gaios is a vibey spot for a late-night coffee or drink, while Café Kalimera, on the town’s square, plays a range of funky music and serves great wines. Ready for some serious pampering and island hopping? Get in touch with our friendly charter broker, or leave a message here or by phone. Insider Tip: The island hosts an annual classical music festival at the end of August, which is not to be missed.